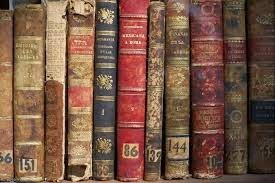 Historical Books Have Their Own Personalities ~ Ron Samul, M.F.A. Those who are passionate about books know there is something intrinsic about reading, imagination, and living a kind of second life. In Historical Books and Their Personal Histories, appearing on the Poor Yorick: A Journal of Rediscovered Objects, I discuss how a reference book for a whaling ship is sent around the world and back again. This odd story and the history that these book contain aren't in the printed matter, but in the covers, the wear, and the notes in the margins. It begs the question when a book shifts from being a book to being an artificial?